After you’ve taken a handful of yoga classes, you may start to get picky about things. For instance, your mat. If you are taking classes on a regular basis and have found yourself wishing that you could grip the mat more securely, the following 5 mats might be worth the investment! These mats are by no means necessary to practice yoga, but you will notice a difference and you may really like using them. These are not mats you will find in your local Tesco, so be warned, they are a bit more costly. 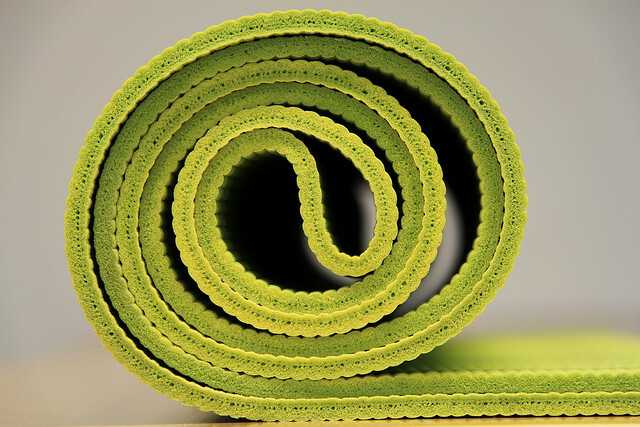 Jade Professional Travel Yoga Mats. Jade mats are made from natural rubber and in my experience have exceptional grip. They come in a variety of colors, as well as other thicknesses, besides the travel model. Typically, the thicker the mat, the more expensive it is. If you like A LOT of cushioning, go for the thicker mat, but usually, the “travel” models work just fine and are easier to carry to class. They still have the grip you are looking for, but not the weight. The thicker mats can weigh over 8lbs!! The international distributor for JadeYoga is www.jadeyogashop.eu. Travel Mats start at €65. Manduka PROlite Mats. Manduka are another company selling natural rubber mats, as well as eco-friendly PVC mats, like this PROlite mat. This is a good quality mat that will grip well from the first use. Like the Jade mat above, this Manduka mat is a “travel” model, so it is convenient to carry to class. Their more cushioned mats feel great, but weigh over 8lbs. The company ships internationally and often runs special offers on mats, so keep an eye out! You can also get a 10% discount on your first order. PROlite mats start at €65. www.manduka.com/eu. Manduka eKO Lite Mats. This is another great mat from Manduka in a “travel” model. The eKO Lite is made of natural rubber, giving it great grip. Be aware that the rubber mats do carry a smell of rubber for the first few weeks of practice. A good airing out and wipe with water will help eliminate the smell more quickly. www.manduka.com/eu. eKo Lite mats start at €50. Kino Karma TPE Mats. These mats not only provide great grip, but also look nice with a delicate design and dual colors. The mats are made of TPE (thermoplastic elastomers), which is generally a mix of plastic and rubber. They are available online from www.theyogashopuk.com. Kino Karma mats start at £50. EDIT: THIS MAT IS NO LONGER AVAILABLE AT THE SITE LISTED. EkoTex Grip Sticky Mats. The Grip Sticky mat is another great option made of high quality PVC. There are no dangerous chemicals used in the production of the mat, unlike some cheaper mats. It has a dot texture similar to the Manduka PROlite mat and comes in a variety of colors. This is the most affordable of the sticky mats at £22. Available from ekotexyoga.co.uk.